To Cite: Shahraki S, Rabi Nezhad Mousavi M. Determination of Virulence Factors in Clinical Multidrug Resistance Enterococci Isolates at Southeast of Iran, Jundishapur J Microbiol. 2017 ; 10(5):e45514. doi: 10.5812/jjm.45514. Background: The enterococci are responsible for infections including bacteremia and endocarditis which are usually resistant to multiple antibiotics. This nosocomial agent probably harbors putative virulence factors which increases their capability to colonize hospitalized patients. Objectives: This study was aimed in order to find the frequency of various virulence factors in enterococci and their relationship with multidrug resistance (MDR). Methods: The samples were collected from different hospital wards including; Intensive care unit (ICU), cardiac care unit (CCU), pediatrics department, internal wards, and transplantation. The isolates were detected by biochemical tests and in order to determine the antibiotic susceptibility pattern, disk diffusion agar (kirby-bauer) was accomplished. Then, MICs (Minimum inhibitory concentrations) of vancomycin were determined by E-test strips. For molecular examinations and detection of drug resistance genes, the simple polymerase chain reaction was used. The multiplex PCR was used in order to detect virulence factors. Results: Total of 85 isolates were obtained from one university teaching hospital in southeast of Iran. Approximately 95% of isolated which were from urine specimens and 34% of isolates were collected from pediatrics units at hospital. Tetracycline resistance (48%) has been observed with a high frequency and related to the tetM gene. Furthermore, eighteen isolates were recognized as MDR strains that carried vanA, aac (6)-Ie-aph (2)-Ia, ermB, and tetM genes. Among virulence factor genes, asa1 (69%) and gelE (55%) are more frequently observed in both species. In general, we found Enterococcus faecalis strains more prevalent. Also, E. faecium was related to antibiotic resistance genes in nosocomial infection. Conclusions: The data was indicated a high prevalence of multiple antibiotics resistance genes with virulence determinants in enterococci and also considered resistant isolate in pediatrics unit. The current results can be recommended in order to change new strategies for antibiotic therapy, because this serious pathogen is important for treatment and eradication in hospitals. Furthermore, the biofilm formation was regulated and constructed by virulence determinants that could be a candidate for enterococcal treatment. Enterococci are facultative anaerobes with adaptation processes for survival in different environments and also colonization in the human. These opportunistic bacteria are related to life-threatening infections such as endocarditis and bacteremia (1). High prevalence among Enterococcus faecium species is associated with high-level Glycopeptide resistance, despite the fact that E. faecalis are observed as the major species in clinical infections. These species are typically detected from urine specimens in intensive-care unit (ICU) of the hospital, therefore they are important for treatment (2). Entrococcus faecalis and E. faecium are known as a significant nosocomial agent in the world, and also are present as the most common Gram-positive pathogens which are isolated from patients in the United States and in several European Union countries (3). The horizontal gene transfer can interfere to disseminate resistance genes in bacteria. Also selective pressure by drugs had a major role in spreading of resistance (2, 4). Enterococci are also prominent for wide-range antibiotic resistant. In this respect, genetic mobile elements such as conjugative plasmids and transposons are able to distribute resistance genes (5). Glycopeptide resistance is encoded by the van operon and can be partitioned into several types, of which the most broadly reported are vanA and vanB genotypes (6). The other significant gene, aac (6)-Ie-aph (2)-Ia, encodes bifunctional aminoglycoside-modifying enzyme AAC (6) - APH (2) which are responsible for high-level gentamicin resistance (HLGR) in enterococci. HLGR strains (MIC > 500 µg) are crucial due to neutralize synergistic properties (the combined β-lactam or glycopeptide and an aminoglycoside) and leading to failure treatment in threatening enterococcal infections (7). Therefore, enterococci are noteworthy because of multiple drug resistance, nosocomial infections, and particularly being capable of transferring antibiotic resistant genes to other microbes (8). The virulence determinants may induce the development of pathogenesis. Enterococci genes implicated with attachment and colonization in the infection site, including AS (aggregation substance), Enterococcal surface protein (ESP), gelatinase, hyaluronidase, cytolysin, and collagen adhesion protein (Ace) (9). The aim of the study is a determination of virulence factors in multidrug resistance (MDR) enterococci isolates with respect to nosocomial infections. One hundred eighty two samples were randomly obtained from one hospital at Southeast of Iran (Zahedan hospital of Ali-Ibn-Abi-Taleb) from September 2013 to November 2015. The origins of isolates were as follows: urine, blood culture, cerebral spinal fluid (CSF), urinary catheter, and lung pleural fluid, vaginal and rectal swab. The samples were collected from different hospital wards including; Intensive care unit, cardiac care unit (CCU), pediatrics department, internal wards, and transplantation. The study was approved by the regional ethics committee of the Zahedan University of Medical Sciences School, Iran; which is conformed to provisions of the Declaration of Helsinki. The identification of enterococci species was evaluated by biochemical tests including; Gram staining, catalase test (3% v/v hydrogen peroxide), growth on bile esculin agar, salt tolerance (6.5% NaCl), pyrrolidinyl arylamidase reaction (MAST PYR, UK), fermentation of 1% carbohydrate (Merck-Germany), reduction of methylene blue milk (0.1%), tellurite 0.04% tolerance and etc. Furthermore, Enterococcus faecalis ATCC29212 was used as a positive control for biochemical characterization. The antibiotic susceptibility detection was performed by disk diffusion agar (MAST-UK). Then, MICs (minimum inhibitory concentrations) of vancomycin were determined using E-test strips (Cat No 92057- Liofilchem Italy) based on (clinical and laboratory standards institute) CLSI’s guidelines 2015 (10). Furthermore, Enterococcus faecalis ATCC29212 was used as a control strain. DNA extraction (chromosomal and plasmid DNA) was conducted according to the protocol of Qiagene kit (mericon DNA Bacteria plus kit-Cat.no.69534, Germany). Detection of a specific gene (ddl: d-Alanine d-Alanine ligase) relevant in both species was determined in order to confirm phenotypic identification. PCR were also performed in a final volume of 50 µL containing: 1 µL of each primer (0.3 mM), 25 µL PCR Master Mix (PCR Master Mix (2X) K0171 Fermentase Thermoscientific-Denmark) containing 0.05 u/µ taq DNA polymerase, 0.4 mM dNTPs, 4 mM MgCl2, reaction buffer 2x, and 2 µL template DNA (11). Simple polymerase chain reaction (PCR) was carried out for recognition of antibiotic resistant genes with specific primers (Genfanavaran Co.) as shown in “Table 1”. Reactions were obtained with an initial denaturation at 95°C for 10 minutes, 30 cycles of amplification following by denaturation at 94°C for 1 minute, different specific annealing between 50° - 56°C (Table 1) for 1 minute, and extension at 72°C for 1 minute, and a final extension at 72°C for 10 minute. However, multiplex PCR conditions for virulence determinants; asa1 (aggregation substance), cylA (cytolysin), ace/acm (adhesion bind to collagen) esp (Enterococcal surface protein), gelE (gelatinase), and hyl (hyaluronidase) were as follows: initial denaturation at 95°C for 10 minutes, followed by 35 cycles of denaturation at 94°C for 30 - 60 seconds, annealing 56°C (Table 1), and extension at 72°C for 30 - 60 seconds. The final extension was 72°C for 5 - 10 minutes. The PCR products were submitted to electrophoresis on 1.5 % agarose gels which were stained with ethidium bromide in order to observe under ultraviolet light. Enterococcus faecalis ATCC 51559 and Enterococcus faecium ATCC 51299 were used as control strains. The data was analyzed statistically using chi-square test and exact test fisher. A P value of ≤ 0.05 was considered statistically significant. 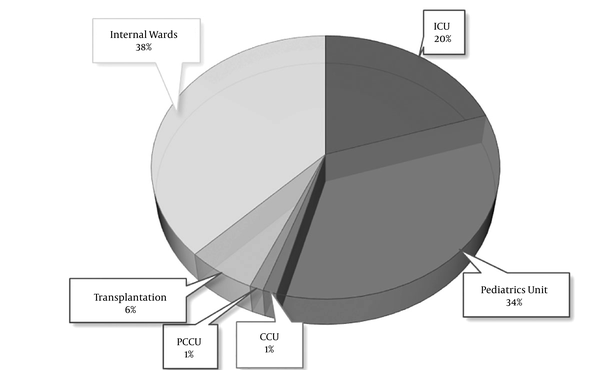 Approximately 95% were related to clinical infections from urine specimen, 3.5 and 1% were obtained from blood culture and a urinary catheter, respectively. “Figure 1” shows a description of frequency in enterococci that isolated from different wards. Eighty five isolates were observed phenotypically and genotypically from hospital infections including 63 E. faecalis and 22 E. faecium strains. PCCU, Pediatrics cardiac care unit. A higher rate of antibiotics resistance was observed in E. faecium compared to E. faecalis. Based on disk diffusion, antibiotics resistance pattern is displayed in “Table 2”. All vancomycin resistance cases showed the MICs ≥ 256 µg/mL and carried vanA gene while the vanB gene was not detected. PCR result was clarified the prevalence of vanA 21% (18/85), aac (6´)-Ie-aph (2´´)-Ia genes (HLGR) 27% (23/85), ermB (erythromycin resistance) 40% (34/85), and tetM (tetracycline resistance) 48% (41/85) from total 85 enterococci isolates. Eighteen isolates (21%) were detected with MDR genotype that also 54% of E. faecium (12/22) and 9% of E. faecalis (6/63) isolates observed as MDR strains. These isolates harbored four antibiotic resistance genes (vanA, aac (6)-Ie-aph (2)-Ia, ermB, and tetM). bThe table just illustrated a high frequency of antibiotics resistant in E. faecium more than E. faecalis by disk diffusion method (P < 0.05). cThese antibiotics were evaluated both phenotypically and genotypically. The presence of virulence factor genes, asa1 69% (42/63 E. faecalis and 17/22 E. faecium isolates), cylA 14% (only 12/63 E. faecalis isolates), ace/acm 40% (26/63 E. faecalis and 8/22 E. faecium isolates), hyl 21% (11/63 E. faecalis and 7/22 E. faecium isolates), esp 41% (24/63 E. faecalis and 9/22 E. faecium isolates), and gelE 55% (32/63 E. faecalis and 15/22 E. faecium) were detected in all isolates. In this respect, these genes were found in E. faecium more than E. faecalis (P < 0.05). The virulence genes were identified genotypically in varying proportions in MDR and Non-MDR isolates (Figure 2). Non-MDR isolates were provided with diverse combinations of virulence genes containig asaI- gelE and asa1- gelE-esp-ace genes. On the other hand, among MDR strains, high prevalence of asa1-esp were detected. As shown in “Table 3”, MDR strains characterization are represented and defines precisely. Comparison of single or multiple virulence genes which influenced by E. faecalis and E. faecium MDR and Non-MDR isolates. Numbering on the x axis symbolizes a number of factors; the percentage of strains on the y axis is a certain number of virulence factors. Abbreviations: M, male; F, female; Am, Ampicilin; Ni, Nitrofurantoin; Im, Imipenem; Chl, Chloramphenicol; Syn, Quinupristin/Dalfopristin; Cip, Ciprofloxacin; Pi, Piperacillin; Li, Linezolid; Fo, fosfomycin; MICv, the strains associated with high level vancomycin resistance. The present research aimed in order to determine virulence determinants’ frequency in MDR strains. The results was indicated 18 out total eighty five isolates are related to MDRs, and the majority of MDR isolates were associated with E. faecium species (16, 17). Recent studies also described a gradual increasing of MDR isolates throughout nosocomial infections (16, 18). Different reports pointed out two major enterococci species associated with hospital infections. Wang et al. (2013) showed that vancomycin resistance among clinical E. faecium isolates increased considerably from 2002 to 2010 at Taiwan. They found the multidrug resistance strains with high frequency correlated with hospital patients and outpatients. Enterococcus faecium isolates were significantly more resistant to ampicillin, ciprofloxacin, erythromycin, gentamicin (with MIC higher than 1024 µg), and nitrofurantoin, whereas, more susceptible to tetracycline compared with those of E. faecalis species (1). As of Wang and colleagues report, in our study, the most of antibiotic resistance isolates was associated with E. faecium species. The spreading of enterococci in hospital infections commonly shows a similar pattern. In this regard, Hallgren et al. was evaluated enterococci species in ICU department, obtaining 244 (76%) E. faecalis, 74 (23%) E. faecium, and 4 (1%) for other species which is derived from December 1996 to December 1998. Furthermore, a higher rate of antibiotics resistance was found in E. faecium strains (19). In another study, Sava et al. reported that E. faecalis are more prevalent and E. faecium was predominantly implicated in antibiotics resistance in nosocomial infections, specially in ICU department (9). In regard with the presence of E. faecalis 63 (74.11 %) and E. faecium 22 (25.88 %), our outcome is in line with the previous studies, however we found the most isolates are collected from pediatrics units in the hospital (Figure 1). The first line in the infection process is adherence to host cells and colonization. After colonization, accumulation of bacteria generating an important structure known as the biofilm. The biofilm conducts a defense system to inactivity of antibiotics effects and immunity cell which leads to the persistence of infections (9). The current study presented that the multiple virulence genes are in both genera differently. Aggregation substance (asa1) is a virulence factor dependent on the pheromone-inducible conjugative plasmid and also encodes a surface protein which is implicated with adherence to renal tubular and endocardial cells. This trait has a key role for attachment and construction of biofilm (9). Associated with this surface adhesin, Baldassarri et al. reported asa1 gene in only one vancomycin resistance E. faecalis (vanA positive) from endocarditis, whereas the current study revealed MDR enterococci isolates is collected from UTIs (12). Meanwhile, among acquiring virulence factors genes, asa1 was observed as the most virulence factor in both species, 69% (42/63 E. faecalis and 17/22 E. faecium isolates) and also found more prevalent in MDR strains (61%). The other virulence factor, enterococcal surface protein (ESP) is affective in urinary tract epithelial cells colonization and has a great potential for increasing biofilm formation. The esp gene found on a pathogenicity island in both Enterococci species with similar function (20). The research was conducted in Spain by Coque et al. (21) is represented the frequency of esp as influenced by resistance genes cause leading resistance to ampicillin, erythromycin, and specially ciprofloxacin. They have significantly observed the esp gene more often in antibiotic-resistant E. faecium, with respect to MDR strains, the current study is demonstrated E. faecium species had a higher proportion in both esp gene and antibiotic resistance. Gelatinase is a metalloprotease with a hydrolytic enzymatic required for biofilm formation which is encoded by gelE (17). The gelE gene was observed in 55% (32/63 E. faecalis and 15/22 E. faecium) of all isolates and as the second most pathogenic factor in our study and also 39% of MDR strains associated with this gene. However, recent investigation described different incidences in clinical isolates; for instance, Sabia et al. reported that 70% of vancomycin resistance enterococci isolates carried the gelE; they also found gelatinase activity in E. faecalis species more than E. faecium. Nevertheless, Sharifi et al. detected gelE with 7.9% of vancomycin resistance enterococci in Hospitalized Patients of Northwest of Iran (17, 22). Previous studies have indicated the importance and frequency of gelatinase enzyme in enterococcal infections. Nevertheless, the present study illustrated E. faecium was more concerned with this gene. The other protein that contributed to pathogenesis is ace/acm. The ace gene encoded a putative protein in order to bind to collagen types-I and IV, laminin, and dentin, similar to a collagen-binding protein of Staphylococcus aureus. It has been more persistently recognized in E. faecalis isolates (9). Medeiros et al. (23) reported the invariant incidence of the ace gene among clinical and dairy products of E. faecalis. They have been distinguished the higher frequency of ace gene (73.7%) in clinical samples, which is crucial for strong adherence in colonization and biofilm production. The current finding showed the ace gene in 40% of all isolates (26/63 E. faecalis and 8/22 E. faecium isolates), and any MDR isolates didn’t harbor one. Another virulence factor, cytolysin or a β-haemolytic toxin have an essential role in the severity of endocarditis and bacteriocin activity against other Gram-positive bacteria. Cytolysin operon is carried through plasmid or bacterial chromosome. The cylA gene processes the peptides and activates other genes in cytolysin operon, also allowing them in order to combine until producing the hemolytic toxin (24). Nevertheless, we found the distribution of this gene in 14.1% of all Enterococci, particularly E. faecalis (two isolates were related to MDRs) that associated with UTIs. Moreover, Banerjee et al. represented cylA gene only in 5% of isolates whereas hemolysin production (in blood agar medium) was observed in 39% of isolates, that emphasizing the importance of testing virulence factors both phenotypically and genotypically (15). The spreading factor protein, Hyaluronidase was almost defined in E. faecium, which encoded by chromosomal gene hyl, however observed in E. faecalis rarely that possess the plasmids accompanied this gene. There is the similarity of hyaluronidase enzyme in other bacteria such as Streptococcus pyogenes, S. aureus, and Streptococcus pneumonia (11, 14). In France, the virulence determinants have evaluated regarding glycopeptide resistance. Biendo and colleagues demonstrated this gene in 29.8% of vancomycin resistance of E. faecium (13). In contrast, the present findings specified hyl gene in 21.1% (11/63 E. faecalis and 7/22 E. faecium isolates) of all enterococci isolates, and no MDR isolate was found related to this gene. In summary, this article is a description of the virulence determinants among clinical MDR enterococci isolates in Southeast of Iran. Unfortunately, we have been considered the high rate of antibiotic resistance in vulnerable pediatrics unit, however, the resistant strains are often associated with ICU and CCU units. In this regard, the current results can be recommended in order to change new strategies for antibiotic therapy. A surveillance plan should be carefully organized for prevention this uncontrollable development and appearance of these resistant bacteria. Furthermore, the biofilm formation contributed to pathogenesis and constructed by virulence determinants in enterococci, and also is the candidate for enterococcal treatment. Therefore, further investigations with this issue and in larger statically population is required, because of the existence of both virulence determinant and antibiotics resistance genes, eradication of enterococci in hospital wards is difficult. Furthermore, the possibility of dissemination of resistant species must not be overlooked. We thanks to the laboratory staff in department of microbiology, Zahedan University of medical sciences. Authors’ Contribution: Morteza Rabi Nezhad Mousavi designed the study, sampling, and evaluation of biochemical and molecular tests. Shahram Shahraki managed the work, analysis of data and also study supervisor. Funding/Support: This work was supported by M.Sc. dissertation grant (the M.Sc. thesis of Morteza Rabi Nezhad Mousavi) from Zahedan University of Medical Sciences.